The administration is trying to sell intervention by invoking the successful 1999 NATO air raid, but the two conflicts are totally dissimilar. Within minutes, NATO forces began pounding Serbia with cruise missiles and bombs, the start of what would become the largest military assault on Europe since World War II. In 2000, Serbian president Slobodan Milosevic was ousted, an outcome many analysts think was the eventual result of the NATO air war. Today, that 78-day bombing campaign is being used as a legal and moral precedent in the Obama administration’s case for intervention in Syria. “The intervention in Kosovo, very unpopular, but, ultimately I think it was the right thing to do and the international community should be glad that it came together to do it,” President Obama said to reporters on Friday. The interventions in Yugoslavia in the 90s and the proposed strikes in Syria are similar in that in both cases, Western countries acted -- or would act -- without the consent of the UN Security Council. And in both, a breaking point had been reached: with Assad, it was chemical weapons, but in Kosovo, NATO had said ethnic cleansing was a “red line,” one that Serbs crossed with the Racak massacre of ethnic Albanians in 1999. But looking at the picture on the ground, that’s where the parallels end. First, it’s important to note that what NATO set out to accomplish in Kosovo was much more extensive than what we’re currently contemplating in Syria. 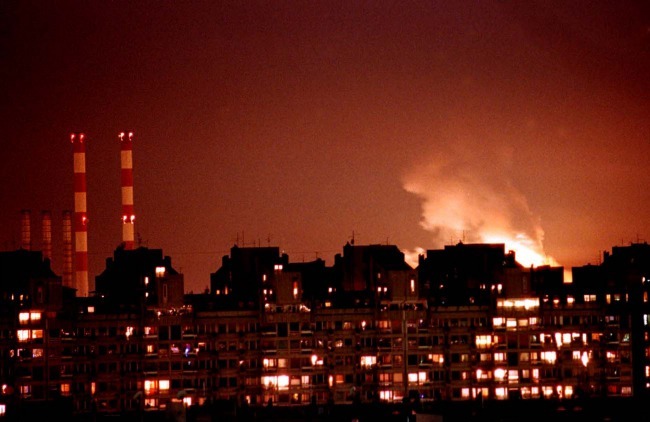 NATO forces bombed Yugoslav military sites from the air after disabling the region’s air defenses. So far, Obama and his team have only suggested firing missiles at key sites in Syria from far-away ships, which would require less time and equipment. 1) Kosovo is in Europe. Obvious, right? But that’s important because it pertains to a big fear that non-interventionists have: That taking any sort of action might further inflame an already tumultuous region. Already, the conflict in Syria is spilling over into neighboring Lebanon and at times even into Turkey, but the Balkan ethnic violence was hemmed in by stable democracies to the north. With Kosovo’s “better neighborhood” comes inducements like NATO and EU membership, which countries can aspire to once they’ve reached a certain level of peace and prosperity. Together, these organizations now contain several former Yugoslav countries. In fact, one reason for intervening in Kosovo was partly to prevent a bigger conflagration: International organizations worried that, under the threat of ethnic cleansing, Albanians would flee to neighboring countries and spread the region’s ethnic conflict further. In Syria, many analysts have the exact opposite fear. 2) There weren’t really any jihadists in Kosovo. Another big concern is that if the U.S. either purposefully or indirectly pushes the rebels into power in Syria, that the “wrong,” extremist rebels like Jabhat al-Nusra will take charge in the aftermath. That wasn’t an issue in Kosovo because those rebels, the Kosovo Liberation Army, didn’t have a strong extremist contingent and they were a reliable on-the-ground partner. What’s more, the opposition in Kosovo had coalesced around one group -- the KLA, in their case -- to a point that the Syrian rebels haven’t. “With so many factions, any victory can easily be followed by internal fighting over the spoils,” Zoltan Grossman, a professor of geography at The Evergreen State College told me. 3) Syria is more ethnically diverse than Kosovo. The main point of tension in Kosovo was between the Serbs and the Albanians, who composed 90 percent of the population. Meanwhile, Syria is a cauldron where Sunnis, Alawites, Christians, Kurds, and other groups all have competing interests and, in some cases, massive rifts between them. This, of course, isn’t to say that just because the two are dissimilar, we shouldn’t necessarily intervene. NATO had a much broader mandate in Kosovo than what Obama is proposing in Syria: To stop the killings of Albanians, to kick the Serbian military out of Kosovo, and to put in peacekeepers, among other things. If Milosevic resisted, NATO made it clear it would follow up with a ground invasion. In Syria, all the Obama administration has said it aims to do is to punish Assad for using chemical weapons -- not even to oust him from power or to help the rebels win, and certainly not to use ground troops. But that’s probably the biggest issue with comparing Kosovo and Syria: In Kosovo, NATO forces were, with few casualties on either side, able to help restore peace. In Syria, we have little hope -- or intention -- of doing so. Comparing the two situations makes little sense if the goals are so divergent.